A group of UNP MPs have reportedly warned that they would not contest the general election unless there were sweeping changes in the party hierarchy. Some young MPs such as Harin Fernando said this at a meeting held in the aftermath of the dissolution of Parliament. 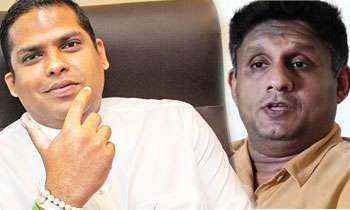 In such a scenario there is a move to nominate MP Sajith Premadasa as the UNP's Prime Ministerial candidate. However, Mr. Premadasa continues to remain non-committal on this matter. If UNP want to be relevant in SL politics, they should change the leadership. It is too early for Sajith . Karu should be the prime ministrial candidate. Sajith should be given a frontline ministry related to the country economy. Then he could prove himself n be a confident prime ministrial candidate for the next election . RW is a person with a long vision but still considering the country situation its better to give the leadership to Sajith Premadasa so that he will get more support. RW can continue as a mentor. Eveyone knows and public outcry is for Sajith to be the leader. if Ranil is objecting, then it is a "Deal" with some sources. "sajith UNP wins" "Ranil UNP will very badly! so it is upto the UNP committee to decide or perish! Internal conflict. Ranil will never leave the leadership. The best solution is to have a vote within the party like they do in US. You need to give what the people want and not what the old cronies of UNP want. You all need to admit that you failed to bring the Yahapalanya which the people wanted. Whole of Sri Lanka knows that Ranil needs some from of power. He is satisfied being the leader of the opposition as the position carried the same perks as the PM. This type of leader need to be removed. In addition he has no charisma when he speaks and no backing at grassroot level. Anybody at this juncture will be a better option than RW, WAY TO GO. interestingly Sri Lanka is not known of its Oscar ward wining acting. The set of parliamentarians that we have are definitely worth candidates. Not only some MPs whole country need SP to be the leader. Do we need a trial and error to know what idiot Sajith is capable of?? But don’t be surprise it could happen as we know mental matuarity of our people. Then they will waste few more years with him by the time he shows what he can do! We don’t need astrologers to predict it. Do we ? For UNP to move forward, it needs a change in the leadership. Yeah, at the opportune time Sajith Premadasa will be the Candidate for PM !!! No need to rush!!!?? Mr. Premadasa is a man of principles. As long as RW is the party leader Mr. Premadasa will be non-committal. Only if RW officially resigns as the party leader will he commit. This is now in RWs hands. Gracefully resign or lead the country to chaos. Over to you Mr. Ranil Wickramasinghe. Yes, he will get the PM candidate position, but Ranil will the leader !!!!!!!!!!!!!!!!!! If Sajith does not want to be that, then get Karu Jayasuriya but not that lousy loosing lazy Ranil again.